A Year of Being Here: Mary Oliver: "To Begin With, the Sweet Grass"
Will the owl bite off its own wings? Will the rivers run upstream? of this gritty earth gift. It's more than the delicate wrist with its personal pulse. It's more than the beating of the single heart. It's giving until the giving feels like receiving. I would like to take this chance. 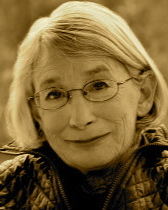 "To Begin With, the Sweet Grass" by Mary Oliver. Text as published in Evidence: Poems (Beacon Press, 2010). Curator's note: A very long poem today, but I didn't have the heart to break it into excerpts. Please take time with it. Savor it. The "friend Paulus" to whom Oliver refers is Paulus Berensohn, dancer, potter, teacher, ecologist.... Read more about him, or watch a trailer from a documentary about his life and work. 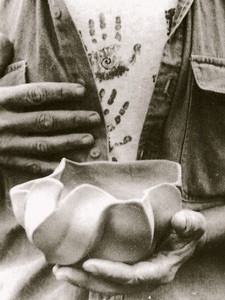 Art credit: Untitled photograph of Paulus Berensohn holding one of his beautiful clay bowls, by True Kelly (digitally enhanced by curator). Mary Oliver may not write Haiku, like some, yet every phrase is a gem- well worth the reading; the absorbing. You were write not to change this or any poem. Thank you. Love what you say about every phrase being a gem. So often true of her work!